We’d love your help. 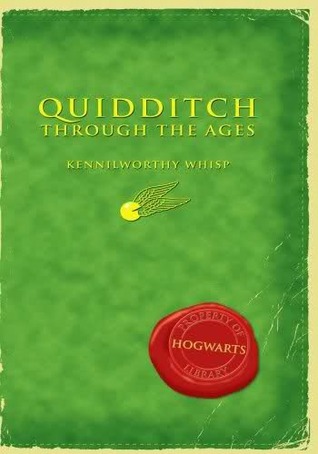 Let us know what’s wrong with this preview of Quidditch Through the Ages by Kennilworthy Whisp. If you have ever asked yourself where the Golden Snitch came from, how the Bludgers came into existence, or why the Wigtown Wanderers have pictures of meat cleavers on their robes, you need QUIDDITCH THROUGH THE AGES. This invaluable volume is consulted The most checked-out book in the Hogwarts Library, and a volume no Quidditch player or Harry Potter fan should be without! 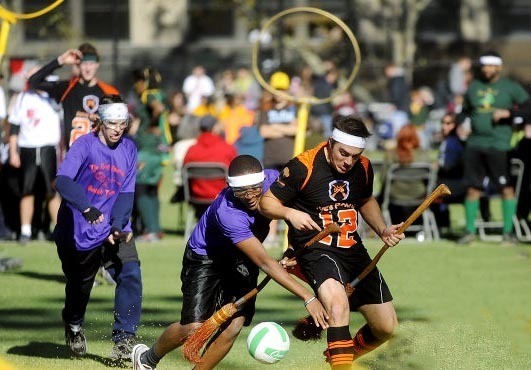 To ask other readers questions about Quidditch Through the Ages, please sign up. Is their notes from Harry and Ron in it like in "Fantastic beasts and where to find them"? Does it have about how Quidditch started? I love this super witty and funny companion to the Harry Potter books. It's been created with such love for detail, it's clear to see that Joanne had much fun writing it. Maybe even as much fun as me reading it. My favourite parts are the history of Quidditch and how it spread to other countries and continents. I especially loved the part about New Zealand. Now, if you love Harry Potter and haven't yet read this you should reconsider your life choices. Get a move! I didn't know what to expect about this book written by the magical J.K. Rowling about the "history" of the magic sport of Quidditch. However, I was happily surprised that while some chapters explaining the rules of the "sport" are kinda tiresome, they were the few, since other chapters were really amusing and entertaining. You "learn" why the decission of using brooms to fly. Also, you "learn" about the official Quidditch teams on the British league, but even also you will le Game On!!! Also, you "learn" about the official Quidditch teams on the British league, but even also you will learn about how popular or not is this sport in other countries and continents. It's a book written with the heart of Rowling allowing to appreciate an important element of the magical world of Harry Potter beyond of what you may knew about on the book series. ...and don't let go away that Golden Snitch!!! This was sadly my least favorite book from the Harry Potter universe. It was still enjoyable to listen to since even "the least interesting from HP" is still HP. To reveal the Qudditch Through the Ages...You'll be enlightened with a brief bits of the History of Magic itself..
Google it :) To reveal the Qudditch Through the Ages...You'll be enlightened with a brief bits of the History of Magic itself..
Google it :) you'll shock . Thank you so much Jo for giving me the opportunity to participate into the charity work with only buying your great,fun,clever and most entertaining books. I think that Rita said it very well: "I've read worse.". It was a fun, quick read but... A bit dull if you ask me. There was a lot of effort to make it funny, but it just felt a bit forced. But I have to admire JK that she put so much thought into the whole universe and has so much knowledge about it. That's fantastic! But I believe that Fantastic Beasts and Where to Find Them where just a bit better. But for you muggles out there, this book has been approved to be shared, and it talks about the most famous sport in the wizarding world - Quidditch. 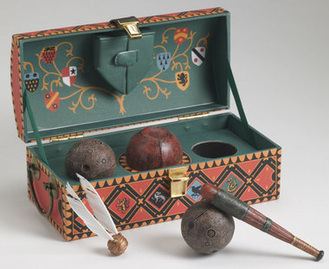 A sport in which Harry Potter was a star, just like his father and many famous people before him! This book speaks about the rules of Quidditch, the history, the famous teams around the world, the most famous players, the most exciting matches, the most devastating injuries, and the most mysterious endings of the matches. While I was listening to it (Yes, I have the audible version - actually the second audio book I have ever read/listened to), this book made me feel like I was a part of this world, the same feeling I always get when I read the Harry Potter series. J.K. Rowling is such an amazing writer, and times and times again, I wish this world was real, and I wish I was part of it. This book is about Quidditch; the most popular sport in the wizarding world and especially at Hogwarts. This book is written like a text book that the students at Hogwarts were able to check out. Ver en la lista de préstamos del libro el nombre de Cedric Diggory y llorar a mares. Slightly better than FB, this one reads like a long a boring textbook on the history of a wizarding game. At least this has magic, no? It's written well. It still just happens to be a short history. I'm not a sports fan as many others are. However, I do enjoy watching some soccer matches whenever there is a European or World Championship. When I watched Harry Potter, I was amused by the wizarding sport #1, Quidditch, but nothing more. Then came the 4th book/movie and with them the Quidditch World Cup and I was enamoured. The atmosphere of the gathering (before it all went wrong), the intricacies of the rules and mascots and rivalries and the games themselves ... the enthusiasm was palpable I'm not a sports fan as many others are. However, I do enjoy watching some soccer matches whenever there is a European or World Championship. When I watched Harry Potter, I was amused by the wizarding sport #1, Quidditch, but nothing more. Then came the 4th book/movie and with them the Quidditch World Cup and I was enamoured. The atmosphere of the gathering (before it all went wrong), the intricacies of the rules and mascots and rivalries and the games themselves ... the enthusiasm was palpable and I'm not in the least bit surprised that there are some people in this world that actually are playing Quidditch and holding tournaments. This book is one of two school books of Harry's that can be found in the library of Hogwarts. He reads it in preparation for becoming the seeker of Gryffindor. Thus, the reader, like Harry, is taught the history and regulations of the sport through very quirky and funny chapters. This particular edition is the brand new audio version narrated by Andrew Lincoln who does a superb job. Many will be surprised and not actually count on his native British accent since he's faking an American one so well on TWD. But believe me, the man is very much British. Want proof? Here it is. J.K. Rowling published this, as the other school book, in support of Comic Relief and - now - Lumos which makes the purchase a good deed on top of a must-have for any fan. And I was like SHUT UP, you old douche-bag! Also, that object of a thief’s curse is amusing. So, let’s dive into the Quidditch Guide! I usually don’t indulge myself much in sports section but Quidditch has always been alluring one! 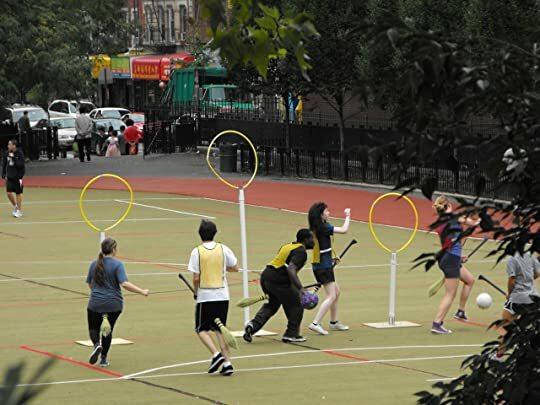 The originality of game – initially known as “Kwidditch” is quite peculiarly appealing. The traces of those borrowed from a witch’s diary are a really fun part, actually the way she described the game. But the all the bladder business of dragons, goats used in the game is really creepy. The Anti-Muggle precautions are bizarre, and types of fouls totally hilarious. I expected it to drag or bore me but it never wavered my attention for a single second. The continents wise categorization along with the team descriptions is, in fact, detailed one but I demand more illustrations. The Snitch which was at first used as a Live bird – Snidget! Later on, The Ministry of Magic banned its use in the game replacing it with charmed Snitch. And all of the sudden nostalgia hits you while relishing the pages – The first game of Harry Potter, Ronald Weasley, Fred and George Weasley (*actually almost the whole Weasley Family, even Ginny played it) and all that cheering for the house – Gryffindor! Funnier and more interesting than Fantastic Beasts. Also, it read more like a genuine Hogwarts text book than Fantastic Beasts did, which was just basically a giant list with a brief summary of various creatures. This had far more magic and history and information in it. Prvo izdanje knjige "Kvidič kroz vekove" sam dobila 2002. od svojih kumova, te mi je ona ostala na prvom mestu i nakon objavljivanja drugih knjiga iz Hogvortske biblioteke tokom 2014. godine. Čitajući serijal upoznali smo se sa igrom koja je u čarobnjačkom svetu popularna onoliko koliko je fudbal ili košarka popularna u našem svetu Normalaca, ako ne i više. Osnovna pravila kvidiča smo savladali zajedno sa Harijem koji je, nakon što je pokazao zavidnu veštinu letenja, bio izabran za tragača. Narav Prvo izdanje knjige "Kvidič kroz vekove" sam dobila 2002. od svojih kumova, te mi je ona ostala na prvom mestu i nakon objavljivanja drugih knjiga iz Hogvortske biblioteke tokom 2014. godine. Čitajući serijal upoznali smo se sa igrom koja je u čarobnjačkom svetu popularna onoliko koliko je fudbal ili košarka popularna u našem svetu Normalaca, ako ne i više. Osnovna pravila kvidiča smo savladali zajedno sa Harijem koji je, nakon što je pokazao zavidnu veštinu letenja, bio izabran za tragača. Naravno, kvidič nije oduvek bio onakav kakvim smo ga mi doživeli u serijalu, te je ovaj vodič pred nama kako bismo pre svega upoznali nastanak igre, a potom se i dobro zabavili čitajući najrazličitije opise pravila i komičnih situacija sa terena. J. K. Rowling is officially my favourite author everrrrr. This 64 paged book was a lot more interesting than most of the 500 paged books I've read. I really loved reading about the history of quidditch, the rules and everything and I'm not one bit of a sports fan! I could have died if I didn't skip like 20 pages! Fue muy entretenido, me gustó mucho, pero me dejo con ganas de más, es que fue tan corto que asshhhhh, lo termine en una sentada, triste pero cierto. Another little book Rowling wrote in order to collect money for Comic Relief. Another book Harry Potter supposedly read during his time at Hogwarts. This one contains the history and rules for Quidditch, the famous wizard sport. I'm not much of a sports person myself, but I do watch the Soccer World Championship and European Championship games so I know what kind of atmosphere Rowling was aiming for and she managed to evoke it (in the actual series as well as here). Did you know that people are a Another little book Rowling wrote in order to collect money for Comic Relief. Another book Harry Potter supposedly read during his time at Hogwarts. Anyway, anybody expecting a story, be warned, because this is the wrong book for you then. It's just little tidbits of quirky information that give a deeper insight into the wizarding world and show just how well thought-out it is and always has been. Much better than Fantastic Beasts. Fantastic quick read on Qudditch. Go Puddlemere United! 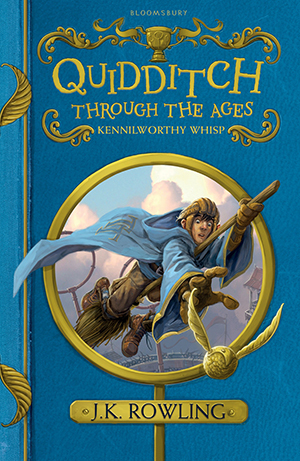 "Kennilworthy Whisp" is the fictional author given by J.K. Rowling for Quidditch Through the Ages. Kennilworthy Whisp was a famous author and renowned Quidditch expert. Whisp has written several books related to Quidditch, including his most famous work, Quidditch Through the Ages . 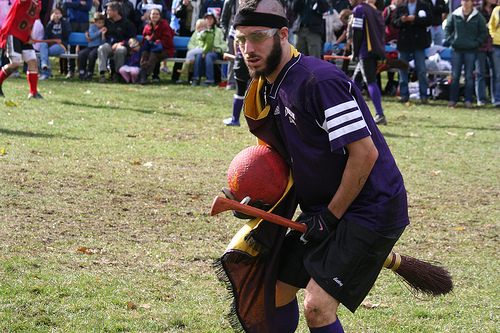 Whisp resides in Nottinghamshire in England, and divides his time between his home and wherever the Wigtown Wanderers "Kennilworthy Whisp" is the fictional author given by J.K. Rowling for Quidditch Through the Ages.